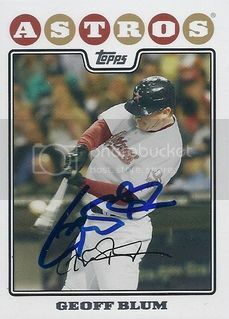 This is our fourth signed White Border Parallel card from the 2008 Topps Opening Day set. Man, I had no idea I would be going after all of these different variations when I started this collection / blog. It's probably a good thing since it's starting to get harder to find new players to add to our base set. 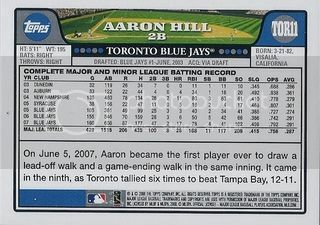 A red border on a Toronto Blue Jays card? Probably not the greatest as far as coordinating colors go but this card is still a nice addition to our 08 Topps collection. 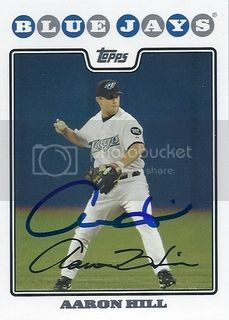 Back in July of 2010 we added the signed base version of Aaron Hill's 2008 Topps card to our collection. 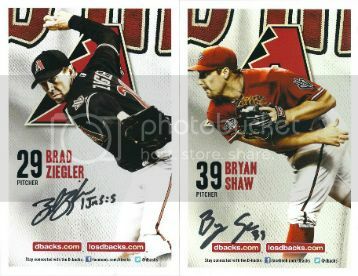 Since I knew he'd be at the Diamondbacks Fan Fest this year, I had to come up with some different cards to get signed. Fortunately he had a few nice options including this Gold Border Parallel. 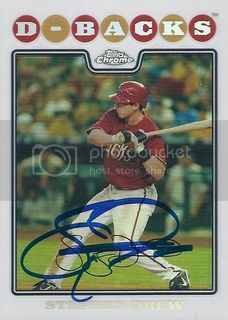 Aaron Hill was one of the players I was hoping to be able to score a few autographs from at Diamondbacks Fan Fest this year. We were able to get tickets for his line with no problem and with my wife's help, got some nice cards signed. The first one is from the Toronto Blue Jays 14 card team set. 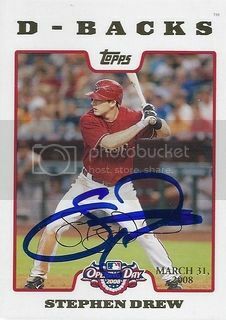 This is the final card that Stephen Drew signed for us at the Diamondbacks Fan Fest earlier this month. This one's pretty cool. It's the bronze refractor version of his 2008 Topps Chrome card. It's numbered to 599 on the back. 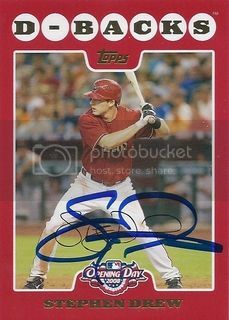 Here's another nice card that Stephen Drew signed for us at the Diamondbacks Fan Fest. This one is a Refractor from the 2008 Topps set. I'm a sucker for a nice Refractor. 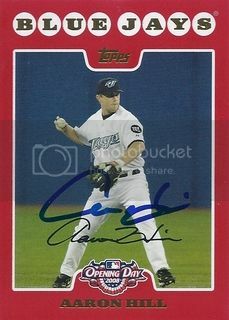 This is our third signed White Border Parallel card from the 2008 Topps Opening Day set. Personally, I think a white border parallel is kind of boring but these are numbered to 2199 so I guess they're kind of cool. 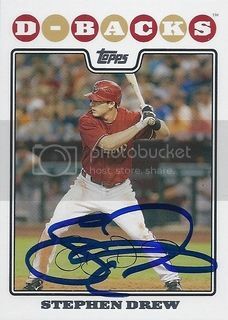 Here's the second card we got signed by Stephen Drew at the D-Backs Fan Fest. This one might be the nicest. It's from the 2008 Topps Opening Day set. The red border looks great with the Diamondbacks Sedona red jersey. Last year the autograph tickets for Stephen Drew were sold out by the time it was my turn to purchase some. This year he was still available when I got to the front of the ticket line. It's a good thing because I had several nice cards for him to sign. 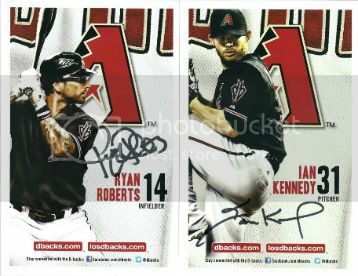 First up is this card from the D-Backs 14 card team set. 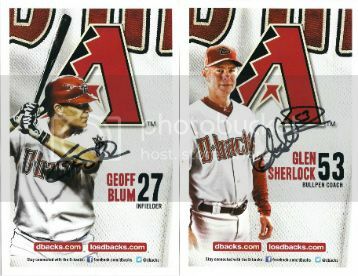 Geoff Blum signed his 2008 Topps base cards for us at last year's Diamondbacks Fan Fest. This year I had to come up with something new. Luckily I bought a few of those 14 card team sets last month. 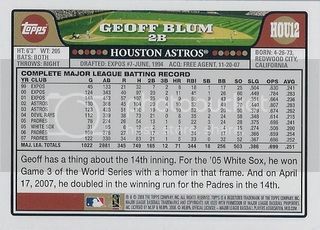 Geoff Blum had a nice card in the Astros one. It's basically the same picture as his Padres card from Series One but it's cropped a little closer and is air brushed to show Geoff wearing Houston gear. I hate to interrupt my Diamondbacks Fan Fests posts but I got something awesome in the mail yesterday. 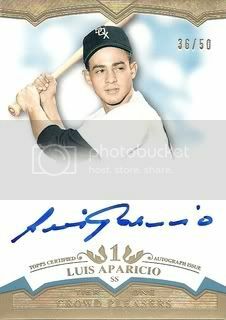 Topps finally sent me the Luis Aparicio autograph from the redemption card I bought off eBay last November. I didn't know exactly what I would be getting but man is this card nice. It's numbered to 50 and has a great on card signature. This definitely has to be one of my favorite Lil Luis autographs in our collection. 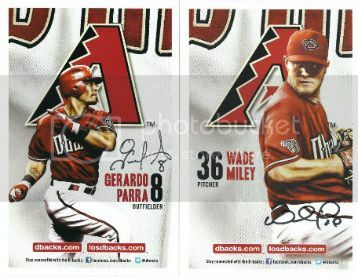 One day last week I bought two more packs of 2012 Topps at my local Walmart. I got lucky and pulled the Ian Kennedy Pie in the Face SP. Of course I brought it with me to Fan Fest. Ian hadn't seen it before so it's pretty cool to know that at least for a few minutes, I had the only signed version in existence. 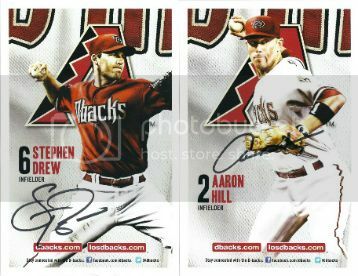 With my wife's help, we were able to score three signed cards for our Daniel Hudson collection at this year's fan fest. 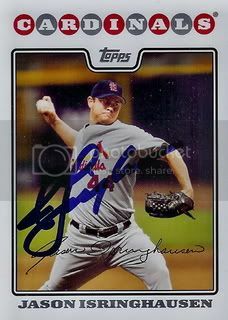 The Allen & Ginter and 2011 Topps are nice but I think the Bowman Chrome Refractor is my favorite. This past Saturday was the annual Diamondbacks Fan Fest. For the first time my wife and son went with me. We had a good time but the crowd was pretty crazy. I read somewhere that there were 25,000 people in attendance this year compared to 10,000 last year. Despite the massive amount of people and me dragging around a three year old all day, I still managed to go home with a nice stack of autographs. No new base cards for our 2008 Topps set this time but we did get a few Opening Day, Chrome, and even a gold border parallel. Autograph tickets for Justin Upton, Kirk Gibson, and Luis Gonzalez were sold out by the time we got there but we did manage to get just about everyone else I wanted. I thought the freebie photos they had to giveaway were pretty nice this year, better than the boring head shots they sometime have. 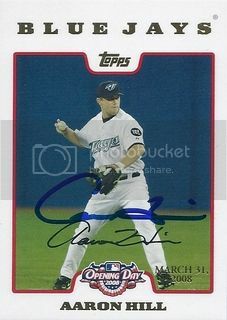 Over the next few days I'll post some of the other stuff we got signed before we get into the 08 Topps stuff. 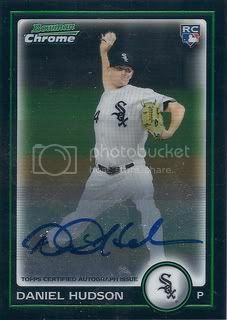 I'm still looking to pick up some more Daniel Hudson autographs when the price is right. 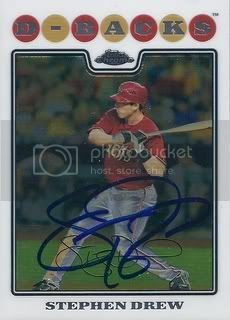 I got this 2010 Bowman Chrome auto for less than five bucks shipped off eBay. I had been watching this one for awhile and was waiting to grab one for cheap. I finally watched Moneyball last weekend. I didn't like it. Brad Pitt and Jonah Hill were good but overall the movie was kind of boring. Maybe it's because I knew how it ended. In it they did talk about Jason Isringhausen and his departure from Oakland a lot. 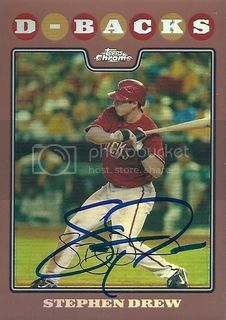 We recently picked up a signed 08 Topps card from a friend on SportsGraphing.com. Here's another card I threw in a low bid on not expecting to win. When all was said and done, my $1.10 bid was the highest. I'm happy. That's a pretty good price for an older jersey card of a former MVP. 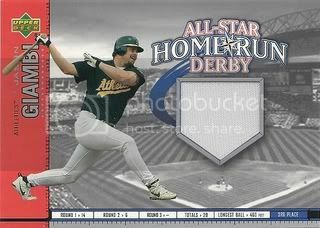 I really like the design on this one and I'm glad it features Jason on the A's. I liked him better before he joined the Evil Empire. Another good TTM return. 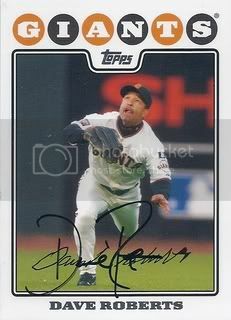 Former Giants outfielder, Dave Roberts signed a card for our set. 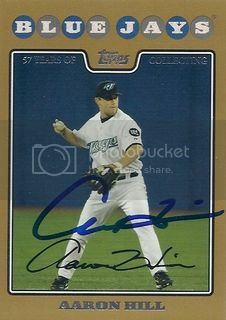 Dave is currently a coach for the San Diego Padres. We sent him a request early last season and just got it back.